We are the proud recipient of the 2010 Clear Choice Award granted by the Glass Packaging Institute as recognition of quality glass packaging design and materials. Our new Art-Deco Collectible Bottles hail stories of Route 66 in American history. Each soda flavor displays one of the screen-print vignettes in the artwork below. Be sure to collect them all! We’re confident you’ll find our soda beverage selection to be a “clear choice” in your search for taste, crispness, and satisfaction. Buy flavors by the case or purchase a mixed selection case. 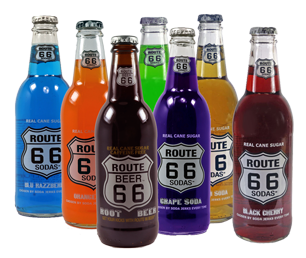 Either way you’ll enjoy top-quality cane sugar sodas and recall the folklore of Route 66! PLEASE BE AWARE OF A SCAM FOR A CAR WRAP USING A SIMILAR NAME AS ROUTE 66 SODAS. THIS IS NOT US!!! THE NAME THAT IS BEING USED IS ROUTE 66 SODAS DRINKS! AGAIN, THIS IS NOT US! SHOULD YOU HAVE ANY CONTACT WITH THEM YOU SHOULD IMMEDIATELY CONTACT YOUR LOCAL POLICE, ATTORNEY GENERAL AND THE BETTER BUSINESS BUREAU!